Despite the differences in the hardware departments of both Galaxy S4 versions, the camera is still the same. Samsung has packed a 13MP snapper inside, which captures stills with a resolution of up to 4128 x 3096 pixels. There's a 2MP camera on the front and both cams can snap a photo or record video simultaneously, but that's not going to be the focus of this section. Overall, the camera units appear to be pretty much the same. The differences in the photo samples are minor and are part due to the quickly changing weather conditions and the different way the chipset processes and outputs the photos. One of the minor differences is that the color reproduction. The Galaxy S4 Octa churns up photos that pack a tad more saturated colors, especially the blues. Additionally, the photo taken with the eight-core version have a bit more detail, than the quad-core one. This however, isn't necessarily due to the difference in camera sensors, but rather the software versions of both phones, as they do differ - XXUAMDE for the i9500 vs. XXUAMDC for the i9505. 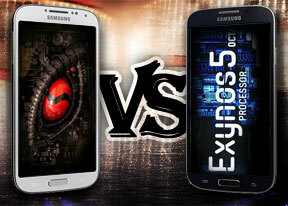 The Exynos Galaxy S4 has newer software version, which might be an explanation for the different camera processing. When we turned HDR on, we also encountered some minor differences. The Galaxy S4 (600) did better in exposing properly the highlights and the shadows simultaneously. That's properly due to a slightly flatter contrast curve, so again, it's a matter of camera tuning. Plus, the difference is not that big (or that noticeable with the naked eye). Here's a comparison, which demonstrates the difference in the resolved dynamic range of both cameraphones with the HDR mode on. The highlighted areas is where there is a loss in image information due to clipping, so the less highlighting there is, the better. Still, it's really hard to notice the difference in dynamic range between the two with a naked eye without the help of computer software. Here it might be useful to see the face off between the Samsung Galaxy S4 and its octa-core brother, along with the Xperia Z added for good measure. Our our Photo quality compare tool allows you to compare the image quality in three different scenes. You can also pit the phones against the last generation of flagships with 8MP cameras by using the upscale and downscale features of the tool. Both the Snapdragon and Exynos versions of the Galaxy S4 store videos in MP4 files with the bitrate averaging 17Mbps. Stereo audio is recorded at around 128Kbps bitrate with a 48kHz sampling rate. 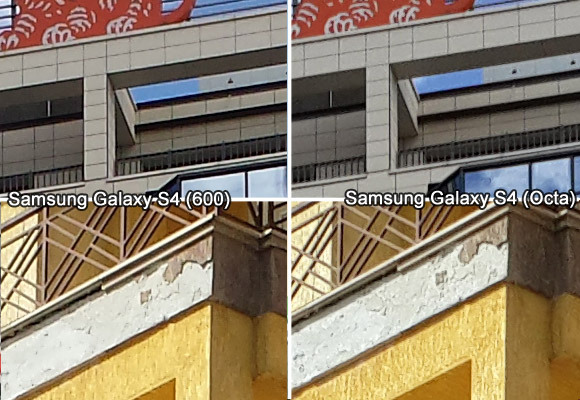 Details and noise levels are somewhat the same on both videos, recorded by the two versions of the Galaxy S4. Colors and white balance is also virtually the same. Here, in video, there are no notable differences in performance or scene rendering. Check out both phones in our Video quality comparison data base as well.